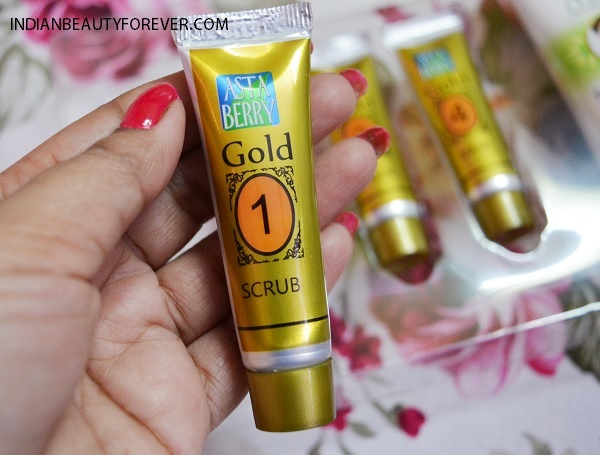 I will review Astaberry Gold Facial Kit that is filled with the goodness of 24 carat pure gold for radiant and glowing skin as per the claims. I have used this a week ago and now, I can share my views on it. By the way, I like using home facial kits since they are easy to use and save a lot of time. 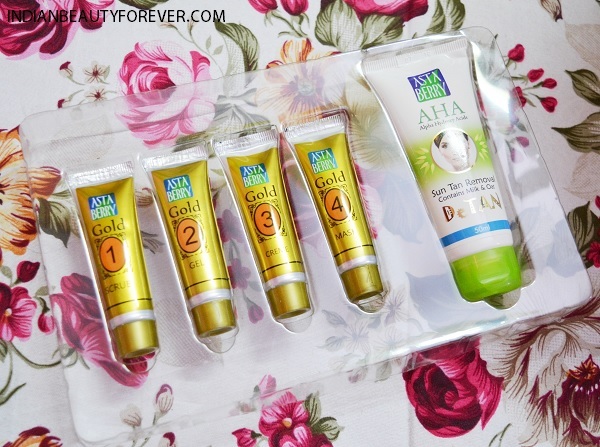 Price: This Astaberry Gold Facial Kit is priced at Rs. 225/- only with free 50 ml tube of Astaberry Detan Sun Tan Removal Face Pack and is available at all major cosmetic outlets and major Online Retailers. 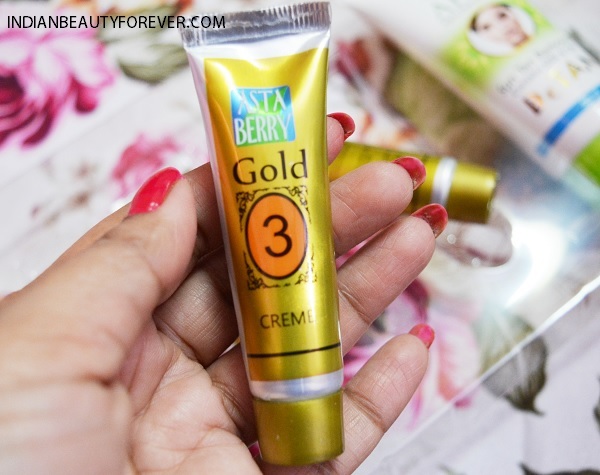 Claims: Astaberry Gold Facial Kit is enriched with Gold as an active ingredient, this facial formula hydrates, firms and moisturizes the skin to reduce fine lines and wrinkles resulting in smooth and healthy skin. Moreover, other herbal extracts of Almond Oil, Olive Oil, Rice Powder, Aloe Vera and Rose deeply refines epidermis of the skin and ensures pretty and glowing skin. 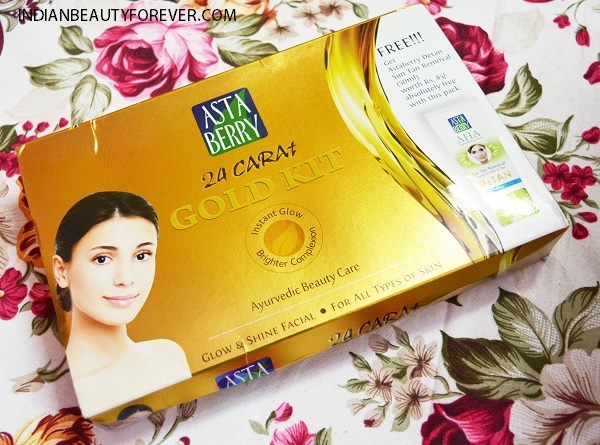 Astaberry Gold Facial Kit works as Skin Brighter Complexion Agent in four different ways including Gold Scrub, Cleansing Gel, Cream and Mask which deeply exfoliates, cleanses nourishes and enhances the skin tone. This is the second step which helps to nourish the skin as this has almond oil, olive oil etc. 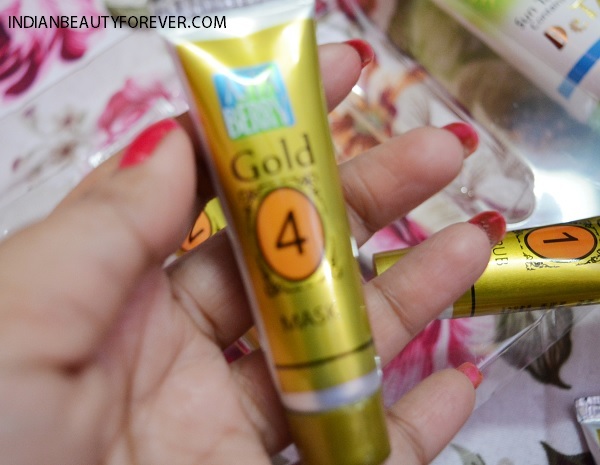 Moreover, the texture is yet light weight for the oily combination skin. 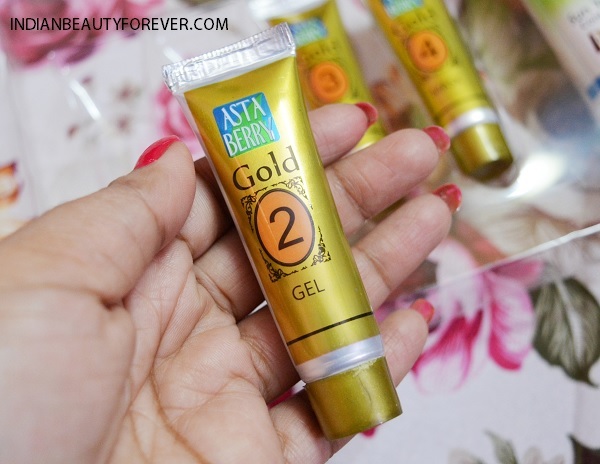 I used this to massage my skin for 3-5 minutes and there are those gold particles that spreads on the skin and makes the skin look glowing but that is temporarily huh!! 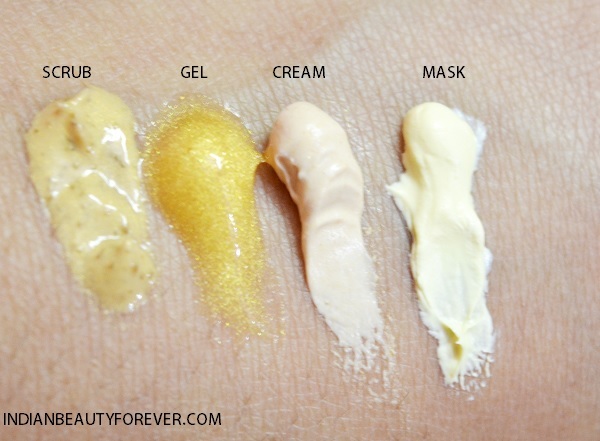 This gold cream is peachy colored cream that is greasy and nourishing hence I used less cream and more of rose water to massage this on my face. This has a very creamy texture and helps to get rid of the dry patches and dryness. This is washable pack/mask that needs to be applied evenly on the face and then washed off. I find this to be decently. Results: After the facial my skin feels softer. Of course all the dead skin, dryness, excess sebum is gone! Moreover skin looks clear. But there is no glow as such but glow can be seen the next day and it last for few days I think this is okay as when we do the facial on our own then the glow stays for a few days only. Furthermore that also depends on your skin type, weather etc. I find this to be affordable and decent for one time usage.